I was not familiar with Andre the Giant has a Posse, but it’s intriguing. Your information is interesting and delves deeper into Andre not so much the man, but the graphic that started it all. I think Andre the Giant was such a larger than life (pardon the pun) man (I’ve heard stories of drinking 100 beers in one sitting and flipping over the car of a heckler of his), people gravitated towards him and perhaps whatever bigger message they took away from the graphic. It’s a really subjective piece of art (but isn’t a lot of art?). I think it is pretty brilliant what Orr did, he changed Andre possibly more than even Fairey ever did, all Fairey did was add OBEY, and at the time Orr made his parody Fairey and OBEY was everywhere so not only did he tell Fairey to shut the hell up with a mask covering andre, he told others to question the person (Shepard Fairey) telling you to question everything. I dont see how this is less creative than what Fairey originally did. Its an idea built on an idea that is built on an idea. Which I think is pretty creative if you take it for more than face value. I don’t know if I ever saw him wrestle (yes I went to a WWF match or two), his size was memorable. It doesn’t surprise me that he lives on through a graphic design or any other form of media. Thanks for the feedback. I completely agree with your point on the idea built on an idea, which is why I mentioned who are we to say what’s uncreative or not? I am a believer in recreating media to express different meaning. My gripe with Orr’s creativity is trying to make profit off it. Other than that, I can appreciate your interpretation of Orr’s piece. 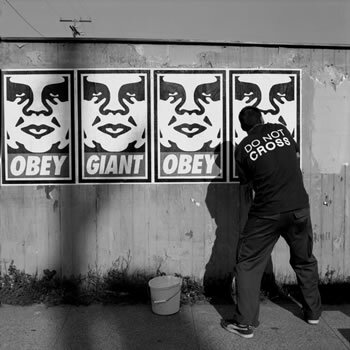 “My gripe with Orr’s creativity is trying to make profit off it.” and you dont have a gripe with Shepard Fairey making millions off of Andre the Giant? Doesnt make sense, its two sides of the same coin. Great point, but I don’t think the original Andre the Giant has a Posse graphic was really intended as a way to make profit, it just caught on. Even Shepard Fairey referred to it as an accident. Once Fairey altered the image due to copyright issues and added OBEY, then, yes, it had an agenda that made profits for him. The piece started off as a spontaneous tracing of Andre and then developed into a profitable agenda, but Orr’s pieces (he’s done the same with Fairey’s Obama HOPE graphic changing it to DOPE) came off as a parody intended for profit (just check his site). Fairey did blatantly take pictures and create an idea around them. Orr took Fairey’s idea and did the opposite. While creative to an extent, it just doesn’t resonate with me as much. Difference of opinion is always welcome here, thanks for the dialogue.